Peggy Jean Reynolds, 87 of Henlawson passed away Wednesday December 5, 2018 at Dignity Hospice House in Chapmanville surrounded by family. Born May 11, 1931 in Logan, she was the daughter of the late Gilbert and Lottie Stump Blankenbeckler. Peggy was also preceded in death by her husband Leroy James Reynolds, brothers Royce Blankenbeckler and Bob Blankenbeckler and his wife Jane. 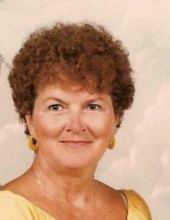 Peggy was a Elementary School Teacher for Logan County Schools for 31 years. She was a member of the Church of Jesus Christ of Latter Day Saints. Those left to cherish her memory include her daughters Duanne (Ronald) Plumley and Dabney (Roger) Bryant, grandchildren Keely (Joey) Marcum, Ricci Mendez (Chuckie Vickers), Kenneth Plumley, Lucas (Jennifer) Bryant, Tressie (Chris) Lopez, and Chris (Jill) Hale, great grandchildren Jacob Wiley, Reed Dingess, Claire Dingess, Cathryn Vickers, Adley Plumley, Ivy Bryant, Cruz Bryant, Josephine Lopez, Silas Hale, Layla Hale, and one on the way Sophia Grace Lopez, one brother Ralph (Maxine) Blankenbeckler, and sister in law Mabel Blankenbeckler Pierce. Funeral Services will be held on Saturday December 8, 2018 at 11:00 AM at Honaker Funeral Home in Logan with Minister Ralph Perry officiating. Burial will follow in Highland Memory Gardens at Godby, WV. Friends may call on the family on Saturday December 8, 2018 from 10:00 - 11:00 AM. To send flowers or a remembrance gift to the family of Peggy Jean Reynolds, please visit our Tribute Store. "Email Address" would like to share the life celebration of Peggy Jean Reynolds. Click on the "link" to go to share a favorite memory or leave a condolence message for the family.